For Sam and Simon’s engagement portraits, we went to a neighbourhood lake in East Vancouver where they both grew up and went to school. It was warming to hear that they grew up in the same neighborhood where I lived as a kid in the 1980s and 90s. Hanging around Trout Lake with them brought back some good memories of summer as a kid. The park was crowded on a warm summer evening, but Sam and Simon looked comfortable together despite the many passers-by. 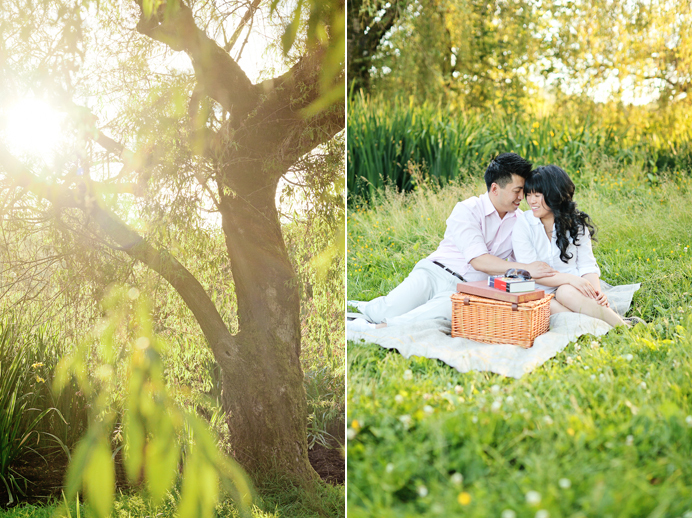 I love the picnic scene we created together and beautiful warm light we got that evening. Here’s a sneak peek. Next Post Facebook “Like” button broken? 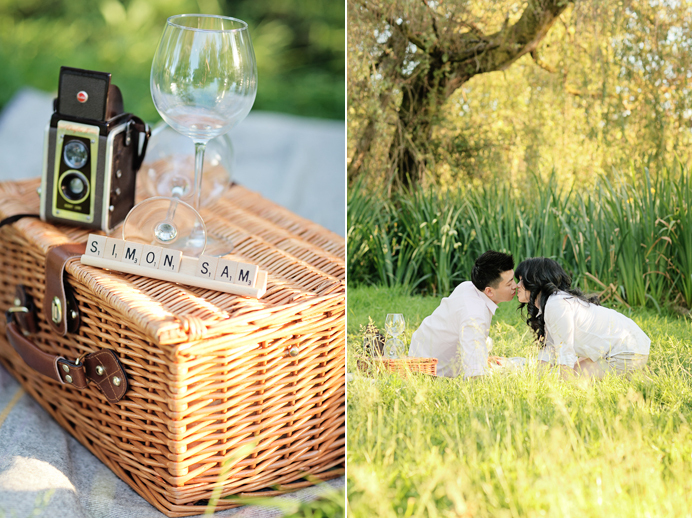 I love the picnic basket shot, spelling their names in scrabble pieces was a nice touch! The pictures are very beautiful. The setting is very unique. I can’t believe this is in Vancouver. Beautiful pictures! You two look great!! Post more pictures please! This picture is so romantic. Simon and Sam, you guys are so cute. I hope (one day) my engagement photos are as beautiful as these.. i can’t wait to see the rest of them. Wow! very nice pictures guys!!!Congratulations!! The pictures are beautiful, very natural and surreal. Love it! The pictures are very beautiful, my favor picture is the kissing one. Congrats! These photos look like the kind of engagement photos every couple hopes theirs turns out like lol! Great job with the pictures! Looking great! Awesome pictures. Can’t believe that was at Trout Lake. Breath taking beauty at its best. Great picture, Great Love…. i love your pictures you guys, can’t wait for your wedding photos! Great work. Love the pictures! You guys look awesome! Love the pictures! The green and yellow from the trees and grass are a great backdrop!